Aug. 28, 2018, SAN FRANCISCO – Adrian Harte, the blogger whose website, Faith No More 2.0 (newfaithnomore.com), has become the pre-eminent source for all things Faith No More, releases the book, “Small Victories: The True Story of Faith No More” on Sept. 12 via Jawbone Press. While not an official book from Faith No More itself, the 376-page offering features interviews with multiple band members, managers and key figures from the band’s 39-year history and has the full endorsement of the San Francisco-based group. 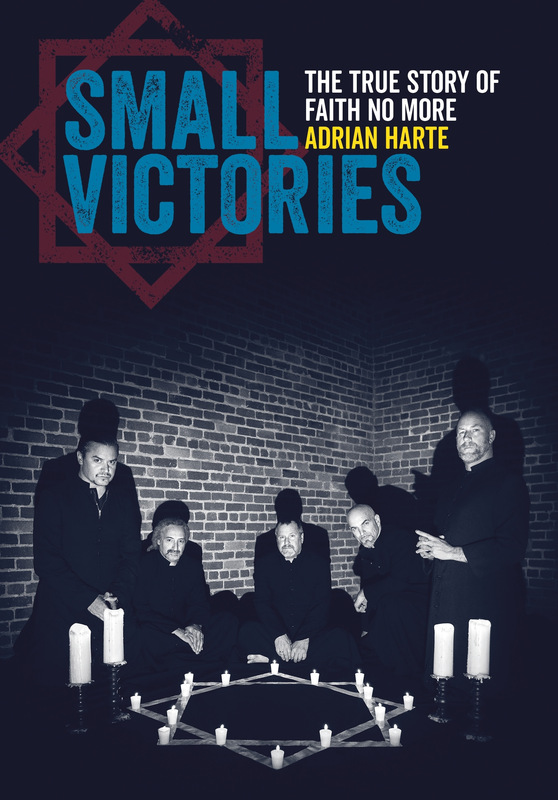 “Small Victories…” tells how such a heterogeneous group formed, flourished, and fractured, and how Faith No More helped redefine rock, metal and alternative music. The book chronicles the creative and personal tensions that defined and fueled the band, forensically examines the band’s beginnings in San Francisco’s post-punk wasteland, and charts the group’s ascent to MTV-era stardom. Based on meticulous research and hundreds of interviews, the book combines a fan’s passion with a reporter’s perspicacity. Adrian Harte is an experienced journalist and communications professional who works as a media intelligence manager for UEFA, the European football governing body. 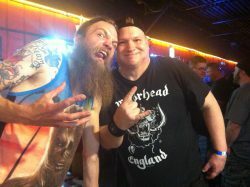 Since 2009 he has run newfaithnomore.com, through which he has become known and trusted by the band, their management and their fans. He lives in Aubonne, Switzerland. LONG LIVE FAITH NO MORE. SAN FRANCISCO, June, 2016 – Faith No More’s landmark debut, We Care A Lot, which was initially released in 1985 and has been out of print for 20 years, sees an Aug. 19 reissue via Bill Gould’s Koolarrow Records. The original 10-song album, remastered by Maor Appelbaum via the original reels Gould alluded to, is enhanced with nine bonus tracks including demo versions (taken from the original 8-track tapes) of “Greed,” “Mark Bowen,” “Arabian Disco” and “Intro,” live versions of “The Jungle” and “New Beginnings” and new mixes, via Matt Wallace, of “We Care A Lot,” “Pills for Breakfast” and “As The Worm Turns.” Liner notes from keyboard player Roddy Bottum and behind-the-scenes photos will be included with the physical release. 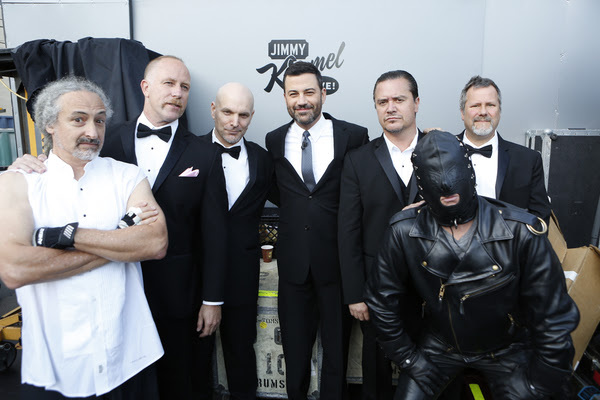 FAITH NO MORE – PERFORM “SUNNY SIDE UP” AND “SEPARATION ANXIETY” ON JIMMY KIMMEL LIVE! Below are two live performances from FAITH NO MORE which aired on Jimmy Kimmel Live!, on September 3rd, 2015. 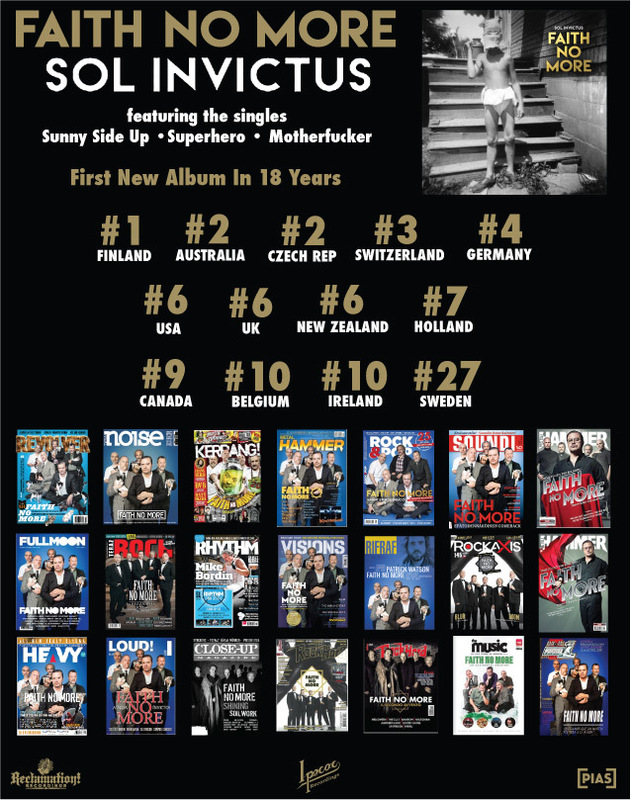 May 27, 2015, SAN FRANCISCO – Faith No More’s Sol Invictus, the Bay Area band’s first new album in eighteen years, has landed atop international charts with the ten-track release at #2 in Australia, #4 in Germany, #6 in the UK and #6 in the United States (#14 on Billboard’s Top 200). “We are honored to be a part of the FNM team and very proud of the success of Sol Invictus,” added Greg Werckman, co-owner of Ipecac Recordings. “Of course, none of this would have happened without the band delivering such a fantastic record and them having faith in us to handle it properly.” The album was released as a joint partnership between the Faith No More’s own Reclamation Recordings and Ipecac. In the United States the album also debuted at #1 on Billboard’s Hard Music and Independent Album charts as well as #2 on both the Rock and Alternative Album charts. Faith No More returns to North America this summer, the band launches their European tour on Friday. 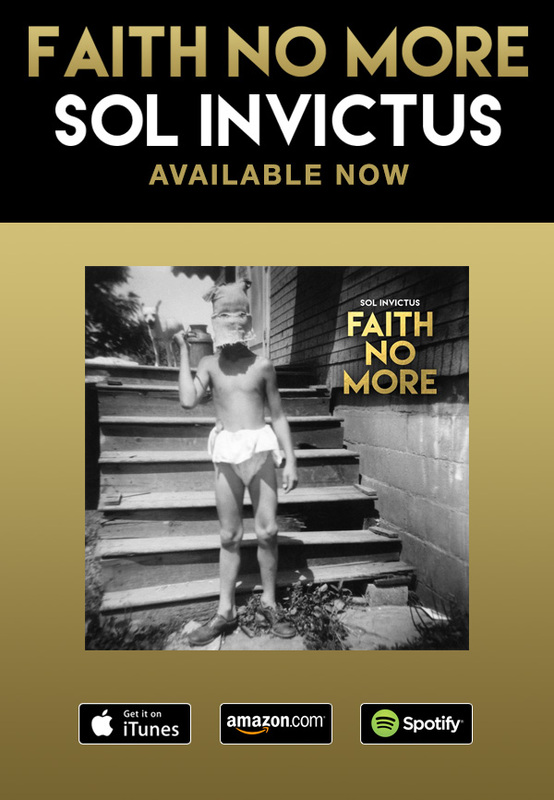 FAITH NO MORE “Sol Invictus” – Available Now! SAN FRANCISCO, May 6, 2015 – Faith No More, who release Sol Invictus, their first new album in eighteen years, on May 18, will be live streaming their May 8 concert from Detroit via Yahoo! Live at 9:15 pm eastern: https://bit.ly/1bQZvmu. The show, which will be broadcast from The Fillmore, is one of the band’s first North American performances since 2010 and is part of a string of sold out dates by the Bay Area outfit. Faith No More returns to North America in late July with a dozen additional dates including an August 5 performance at Madison Square Garden and a headlining spot at Heavy Montreal on August 8. Bumbershoot recently announced Faith No More as one of the headliners of the venerable Seattle festival. Sol Invictus will be streaming in its entirety via NPR on Monday, May 11, with Pandora giving listeners an early listen as of May 13. Exclaim will be streaming the album for Canada. The band performs on The Tonight Show on May 13, with the late night TV appearance being Faith No More’s first since 1995. Pre-order bundles, including limited edition vinyl, are available now via http://solinvictus.kungfustore.com in North America and http://faithnomore.firebrandstores.com in Europe. Digital pre-orders, featuring instant downloads of “Motherf***er” and “Superhero” available here: http://geni.us/2L7x. The music arrives as the band announces two additional UK dates: June 14 at O2 Academy (Glasgow) and June 17 at The Roundhouse (London). Faith No More plays the Download Festival on June 13. Sol Invictus physical pre-order bundles, including limited edition vinyl, are available now via http://solinvictus.kungfustore.com in North America and http://faithnomore.firebrandstores.com in Europe. Digital pre-orders, featuring instant downloads of “Motherf***er” and “Superhero” available here: http://geni.us/2L7x.